Romacorp, Inc., the parent company of Tony Roma’s and TR Fire Grill, invites fans everywhere to support children in their local community by purchasing a Make-A-Wish Fundraising Card any day during the month of October. 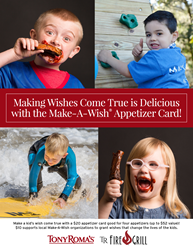 An amazing deal valued at nearly $50, each Make-A-Wish Fundraising Card is available for only $20 and gives guests four free appetizers, letting them help grant a wish while sharing a dish. Proceeds from each card sold at participating Tony Roma’s and TR Fire Grill restaurants will go to the restaurant’s local Make-A-Wish chapter, ensuring the proceeds benefit children in each local community. With the help of volunteers and fundraisers like this one, Make-A-Wish grants a wish somewhere in the world every 35 minutes. The organization has granted more than 270,000 wishes since its inception in 1980, and continues to change the lives of children every day. In November 2016, Tony Roma’s debuted its new global prototype restaurant in Orlando, FL and partnered with Make-A-Wish of Central and Northern Florida by donating a portion of sales from its VIP event to support the organization. In addition, the TR Fire Grill team hosted the “Cookies for a Cause” fundraiser in December 2016, giving guests a sweet way to sprinkle some good-will during the holiday season. The new Make-A-Wish Fundraising program builds on this partnership and brings the fundraising effort to communities in Florida, Texas, Iowa, Illinois, and California. Romacorp, Inc., is the parent company of Tony Roma's restaurants, the world's largest casual dining concept specializing in ribs, and TR Fire Grill, a new chef-inspired American bistro Winter Park, Florida, Honolulu, Hawaii, and Kuala Lumpur, Malaysia. Romacorp, Inc. has nearly 150 restaurant locations in more than 30 countries, and Tony Roma’s is one of the most globally recognizable names in the industry. The first Tony Roma's restaurant opened 45 years ago in North Miami, Florida, while TR Fire Grill launched in 2015. TR Fire Grill is an award-winning restaurant recognized as Best New Restaurant (2016 Winter Park Maitland Ovations Award), Best Craft Cocktail Bar (2016 Orlando Sentinel Best Bets Award), Best Happy Hour (2017 Winter Park Maitland Ovations Award) and Best Cuisine in Orlando (2015 and 2016 OpenTable Awards). Romacorp is also proud to partner with the Make-A-Wish Foundation (http://www.cnfl.wish.org), one of the world's leading children's charities, in an effort to help grant the wishes of children with life-threatening illnesses across Central and Northern Florida. For more information about Romacorp, Inc., Tony Roma’s and TR Fire Grill, visit http://www.tonyromas.com or http://www.trfiregrill.com. Please visit http://www.tonyromasfranchise.com or call (866) 981-0586 for information about Tony Roma's franchising opportunities. For more information about TR Fire Grill franchising opportunities, please visit http://www.trfiregrillfranchise.com. Make-A-Wish grants the wishes of children with life-threatening medical conditions to enrich the human experience with hope, strength and joy. According to a 2011 U.S. study of wish impact, most health professionals surveyed believe a wish-come-true has positive impacts on the health of children. Kids say wishes give them renewed strength to fight their illness, and their parents say these experiences help strengthen the entire family. Headquartered in Phoenix, Make-A-Wish is one of the world's leading children's charities, serving children in every community in the United States and its territories. With the help of generous donors and more than 28,000 volunteers, Make-A-Wish grants a wish somewhere in the country every 35 minutes. It has granted more than 270,000 wishes since its inception in 1980; more than 14,800 in 2015 alone. Visit Make-A-Wish at http://www.wish.org to learn more.